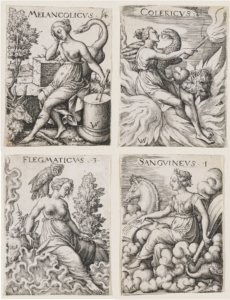 The four temperaments by Virgil Solis (ca. 1530-1562). The new study published September 17 in Nature Human Behaviour. The findings potentially could be of interest to hiring managers and mental healthcare providers. “People have tried to classify personality types since Hippocrates’s time, but previous scientific literature has found that to be nonsense,” said co-author William Revelle, professor of psychology at Northwestern University’s Weinberg College of Arts and Sciences. The new research combined an alternative computational approach with data from four questionnaires with more than 1.5 million respondents from around the world obtained from John Johnson’s IPIP-NEO with 120 and 300 items, respectively, the myPersonality project, and the BBC Big Personality Test datasets. The questionnaires, developed by the research community over the decades, have between 44 and 300 questions. People voluntarily take the online quizzes attracted by the opportunity to receive feedback about their own personality. These data are now being made available to other researchers for independent analyses. From those robust datasets, the team plotted the five widely accepted basic personality traits — neuroticism, extraversion, openness, agreeableness, and conscientiousness. Average — Average people are high in neuroticism and extraversion, while low in openness. “I would expect that the typical person would be in this cluster,” said Martin Gerlach, a postdoctoral fellow in Amaral’s lab and the paper’s first author. Females are more likely than males to fall into the Average type. Reserved — The Reserved type is emotionally stable, but not open or neurotic. They are not particularly extraverted but are somewhat agreeable and conscientious. Role Models — Role Models score low in neuroticism and high in all the other traits. The likelihood that someone is a role model increases dramatically with age. “These are people who are dependable and open to new ideas,” Amaral said. “These are good people to be in charge of things. In fact, life is easier if you have more dealings with role models.” More women than men are likely to be role models. Self-Centered — Self-Centered people score very high in extraversion and below average in openness, agreeableness, and conscientiousness. “These are people you don’t want to hang out with,” Revelle said. There is a very dramatic decrease in the number of self-centered types as people age, both with women and men. “The data came back, and they kept coming up with the same four clusters of higher density, and at higher densities than you’d expect by chance, and you can show by replication that this is statistically unlikely,” Revelle said. Indeed, young males are over-represented in the Self-Centered group, while females over 15 years old are vastly underrepresented. Along with serving as a tool that can help mental health service providers assess for personality types with extreme traits, Amaral said the study’s results could be helpful for hiring managers looking to insure a potential candidate is a good fit or for people who are dating looking for an appropriate partner. “When we look at large groups of people, it’s clear there are trends, that some people may be changing some of these characteristics over time. This could be a subject of future research,” Amaral said.